Famotidine, USP is a white to pale yellow crystalline compound that is freely soluble in glacial acetic acid, slightly soluble in methanol, very slightly soluble in water, and practically insoluble in ethanol. 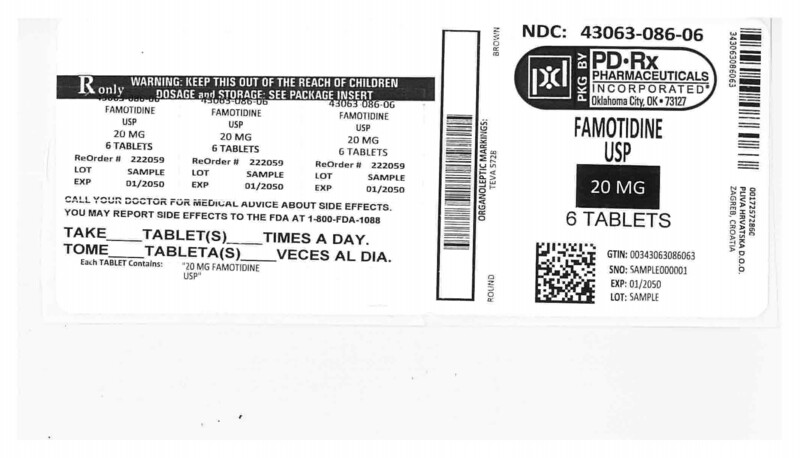 Each tablet for oral administration contains either 20 mg or 40 mg of famotidine, USP and has the following inactive ingredients: colloidal silicon dioxide, hypromellose, magnesium stearate, microcrystalline cellulose, polyethylene glycol, pregelatinized corn starch, sodium starch glycolate, talc, titanium dioxide, yellow iron oxide. In addition the 20 mg contains lactose monohydrate, red iron oxide and triacetin and the 40 mg contains FD&C blue No. 2 aluminum lake and FD&C yellow No. 6 aluminum lake. Single evening oral doses of 20 and 40 mg inhibited basal and nocturnal acid secretion in all subjects; mean nocturnal gastric acid secretion was inhibited by 86% and 94%, respectively, for a period of at least 10 hours. The same doses given in the morning suppressed food-stimulated acid secretion in all subjects. The mean suppression was 76% and 84%, respectively, 3 to 5 hours after administration, and 25% and 30%, respectively, 8 to 10 hours after administration. In some subjects who received the 20 mg dose, however, the antisecretory effect was dissipated within 6 to 8 hours. There was no cumulative effect with repeated doses. The nocturnal intragastric pH was raised by evening doses of 20 and 40 mg of famotidine to mean values of 5 and 6.4, respectively. When famotidine was given after breakfast, the basal daytime interdigestive pH at 3 and 8 hours after 20 or 40 mg of famotidine was raised to about 5. Systemic effects of famotidine in the CNS, cardiovascular, respiratory or endocrine systems were not noted in clinical pharmacology studies. Also, no antiandrogenic effects were noted (see ADVERSE REACTIONS). Serum hormone levels, including prolactin, cortisol, thyroxine (T 4), and testosterone, were not altered after treatment with famotidine. Famotidine is incompletely absorbed. The bioavailability of oral doses is 40 to 45%. Bioavailability may be slightly increased by food, or slightly decreased by antacids; however, these effects are of no clinical consequence. Famotidine undergoes minimal first-pass metabolism. After oral doses, peak plasma levels occur in 1 to 3 hours. Plasma levels after multiple doses are similar to those after single doses. Fifteen to 20% of famotidine in plasma is protein bound. Famotidine has an elimination half-life of 2.5 to 3.5 hours. Famotidine is eliminated by renal (65 to 70%) and metabolic (30 to 35%) routes. Renal clearance is 250 to 450 mL/min, indicating some tubular excretion. Twenty-five to 30% of an oral dose and 65 to 70% of an intravenous dose are recovered in the urine as unchanged compound. The only metabolite identified in man is the S-oxide. Famotidine, 20 mg p.o. h.s., was compared to placebo h.s. as maintenance therapy in two double-blind, multicenter studies of patients with endoscopically confirmed healed duodenal ulcers. In the U.S. study the observed ulcer incidence within 12 months in patients treated with placebo was 2.4 times greater than in the patients treated with famotidine. The 89 patients treated with famotidine had a cumulative observed ulcer incidence of 23.4% compared to an observed ulcer incidence of 56.6% in the 89 patients receiving placebo (p < 0.01). These results were confirmed in an international study where the cumulative observed ulcer incidence within 12 months in the 307 patients treated with famotidine was 35.7%, compared to an incidence of 75.5% in the 325 patients treated with placebo (p < 0.01). Orally administered famotidine was compared to placebo in a U.S. study that enrolled patients with symptoms of GERD and without endoscopic evidence of erosion or ulceration of the esophagus. Famotidine 20 mg b.i.d. was statistically significantly superior to 40 mg h.s. and to placebo in providing a successful symptomatic outcome, defined as moderate or excellent improvement of symptoms ( Table 3). By two weeks of treatment, symptomatic success was observed in a greater percentage of patients taking famotidine 20 mg b.i.d. compared to placebo (p â‰¤ 0.01). Symptomatic improvement and healing of endoscopically verified erosion and ulceration were studied in two additional trials. Healing was defined as complete resolution of all erosions or ulcerations visible with endoscopy. The U.S. study comparing famotidine 40 mg p.o. b.i.d. to placebo and famotidine 20 mg p.o. b.i.d. showed a significantly greater percentage of healing for famotidine 40 mg b.i.d. at weeks 6 and 12 ( Table 4). â€¡ p â‰¤ 0.05 vs. famotidine 20 mg b.i.d. â€¡â€¡ p â‰¤ 0.01 vs. famotidine 20 mg b.i.d. In the international study, when famotidine 40 mg p.o. b.i.d. was compared to ranitidine 150 mg p.o. b.i.d., a statistically significantly greater percentage of healing was observed with famotidine 40 mg b.i.d. at week 12 ( Table 5). There was, however, no significant difference among treatments in symptom relief. â€¡â€¡â€¡ p â‰¤ 0.05 vs. ranitidine 150 mg b.i.d. Table 6 presents pharmacokinetic data from clinical trials and a published study in pediatric patients (< 1 year of age; N = 27) given famotidine I.V. 0.5 mg/kg and from published studies of small numbers of pediatric patients (1 to 15 years of age) given famotidine intravenously. Areas under the curve (AUCs) are normalized to a dose of 0.5 mg/kg I.V. for pediatric patients 1 to 15 years of age and compared with an extrapolated 40 mg intravenous dose in adults (extrapolation based on results obtained with a 20 mg I.V. adult dose). a Values are presented as means ± SD unless indicated otherwise. Plasma clearance is reduced and elimination half-life is prolonged in pediatric patients 0 to 3 months of age compared to older pediatric patients. The pharmacokinetic parameters for pediatric patients, ages > 3 months to 15 years, are comparable to those obtained for adults. Bioavailability studies of 8 pediatric patients (11 to 15 years of age) showed a mean oral bioavailability of 0.5 compared to adult values of 0.42 to 0.49. Oral doses of 0.5 mg/kg achieved AUCs of 645 ± 249 ng-hr/mL and 580 ± 60 ng-hr/mL in pediatric patients < 1 year of age (N = 5) and in pediatric patients 11 to 15 years of age, respectively, compared to 482 ± 181 ng-hr/mL in adults treated with 40 mg orally. Pharmacodynamics of famotidine were evaluated in 5 pediatric patients 2 to 13 years of age using the sigmoid E max model. These data suggest that the relationship between serum concentration of famotidine and gastric acid suppression is similar to that observed in one study of adults ( Table 7). a Values reported in published literature. c Mean (95% confidence interval). The duration of effect of famotidine I.V. 0.5 mg/kg on gastric pH and acid suppression was shown in one study to be longer in pediatric patients < 1 month of age than in older pediatric patients. This longer duration of gastric acid suppression is consistent with the decreased clearance in pediatric patients < 3 months of age (see Table 6). Most adult patients heal within 4 weeks; there is rarely reason to use famotidine at full dosage for longer than 6 to 8 weeks. Studies have not assessed the safety of famotidine in uncomplicated active duodenal ulcer for periods of more than eight weeks. Controlled studies in adults have not extended beyond one year. Most adult patients heal within 6 weeks. Studies have not assessed the safety or efficacy of famotidine in uncomplicated active benign gastric ulcer for periods of more than 8 weeks. Famotidine tablets are indicated for short-term treatment of patients with symptoms of GERD (see CLINICAL PHARMACOLOGY IN ADULTS, Clinical Studies). Famotidine tablets are also indicated for the short-term treatment of esophagitis due to GERD including erosive or ulcerative disease diagnosed by endoscopy (see CLINICAL PHARMACOLOGY IN ADULTS, Clinical Studies). Hypersensitivity to any component of this product. Cross sensitivity in this class of compounds has been observed. Therefore, famotidine should not be administered to patients with a history of hypersensitivity to other H 2-receptor antagonists. Since CNS adverse effects have been reported in patients with moderate and severe renal insufficiency, longer intervals between doses or lower doses may need to be used in patients with moderate (creatinine clearance < 50 mL/min) or severe (creatinine clearance < 10 mL/min) renal insufficiency to adjust for the longer elimination half-life of famotidine (see CLINICAL PHARMACOLOGY IN ADULTS and DOSAGE AND ADMINISTRATION). Prolonged QT interval has been reported very rarely in patients with impaired renal function whose dose/dosing interval of famotidine may not have been adjusted appropriately. Use of famotidine in pediatric patients < 1 year of age is supported by evidence from adequate and well-controlled studies of famotidine in adults, and by the following studies in pediatric patients < 1 year of age. Two pharmacokinetic studies in pediatric patients < 1 year of age (N = 48) demonstrated that clearance of famotidine in patients > 3 months to 1 year of age is similar to that seen in older pediatric patients (1 to 15 years of age) and adults. In contrast, pediatric patients 0 to 3 months of age had famotidine clearance values that were 2 to 4 fold less than those in older pediatric patients and adults. These studies also show that the mean bioavailability in pediatric patients < 1 year of age after oral dosing is similar to older pediatric patients and adults. Pharmacodynamic data in pediatric patients 0 to 3 months of age suggest that the duration of acid suppression is longer compared with older pediatric patients, consistent with the longer famotidine half-life in pediatric patients 0 to 3 months of age (see CLINICAL PHARMACOLOGY IN PEDIATRIC PATIENTS, Pharmacokinetics and Pharmacodynamics). In a double-blind, randomized, treatment-withdrawal study, 35 pediatric patients < 1 year of age who were diagnosed as having gastroesophageal reflux disease were treated for up to 4 weeks with famotidine oral suspension (0.5 mg/kg/dose or 1 mg/kg/dose). Although an intravenous famotidine formulation was available, no patients were treated with intravenous famotidine in this study. Also, caregivers were instructed to provide conservative treatment including thickened feedings. Enrolled patients were diagnosed primarily by history of vomiting (spitting up) and irritability (fussiness). The famotidine dosing regimen was once daily for patients < 3 months of age and twice daily for patients â‰¥ 3 months of age. After 4 weeks of treatment, patients were randomly withdrawn from the treatment and followed an additional 4 weeks for adverse events and symptomatology. Patients were evaluated for vomiting (spitting up), irritability (fussiness) and global assessments of improvement. The study patients ranged in age at entry from 1.3 to 10.5 months (mean 5.6 ± 2.9 months), 57% were female, 91% were white and 6% were black. Most patients (27/35) continued into the treatment-withdrawal phase of the study. Two patients discontinued famotidine due to adverse events. Most patients improved during the initial treatment phase of the study. Results of the treatment-withdrawal phase were difficult to interpret because of small numbers of patients. Of the 35 patients enrolled in the study, agitation was observed in 5 patients on famotidine that resolved when the medication was discontinued; agitation was not observed in patients on placebo (see ADVERSE REACTIONS, Pediatric Patients). These studies suggest that a starting dose of 0.5 mg/kg/dose of famotidine oral suspension may be of benefit for the treatment of GERD for up to 4 weeks once daily in patients < 3 months of age and twice daily in patients 3 months to < 1 year of age; the safety and benefit of famotidine treatment beyond 4 weeks have not been established. Famotidine should be considered for the treatment of GERD only if conservative measures (e.g., thickened feedings) are used concurrently and if the potential benefit outweighs the risk. 1 mg/kg/day p.o. divided b.i.d. up to 40 mg b.i.d. Arrhythmia, AV block, palpitation. Prolonged QT interval, in patients with impaired renal function, has been reported very rarely. In a clinical study in 35 pediatric patients < 1 year of age with GERD symptoms [e.g., vomiting (spitting up), irritability (fussing)], agitation was observed in 5 patients on famotidine that resolved when the medication was discontinued. See PRECAUTIONS, Pediatric Patients < 1 year of age. The studies described in PRECAUTIONS, Pediatric Patients < 1 year of age suggest the following starting doses in pediatric patients < 1 year of age: Gastroesophageal Reflux Disease (GERD) - 0.5 mg/kg/dose of famotidine oral suspension for the treatment of GERD for up to 8 weeks once daily in patients < 3 months of age and 0.5 mg/kg/dose twice daily in patients 3 months to < 1 year of age. Patients should also be receiving conservative measures (e.g., thickened feedings). The use of intravenous famotidine in pediatric patients < 1 year of age with GERD has not been adequately studied. In adult patients with moderate (creatinine clearance < 50 mL/min) or severe (creatinine clearance < 10 mL/min) renal insufficiency, the elimination half-life of famotidine is increased. For patients with severe renal insufficiency, it may exceed 20 hours, reaching approximately 24 hours in anuric patients. Since CNS adverse effects have been reported in patients with moderate and severe renal insufficiency, to avoid excess accumulation of the drug in patients with moderate or severe renal insufficiency, the dose of famotidine may be reduced to half the dose or the dosing interval may be prolonged to 36 to 48 hours as indicated by the patientâ€™s clinical response. 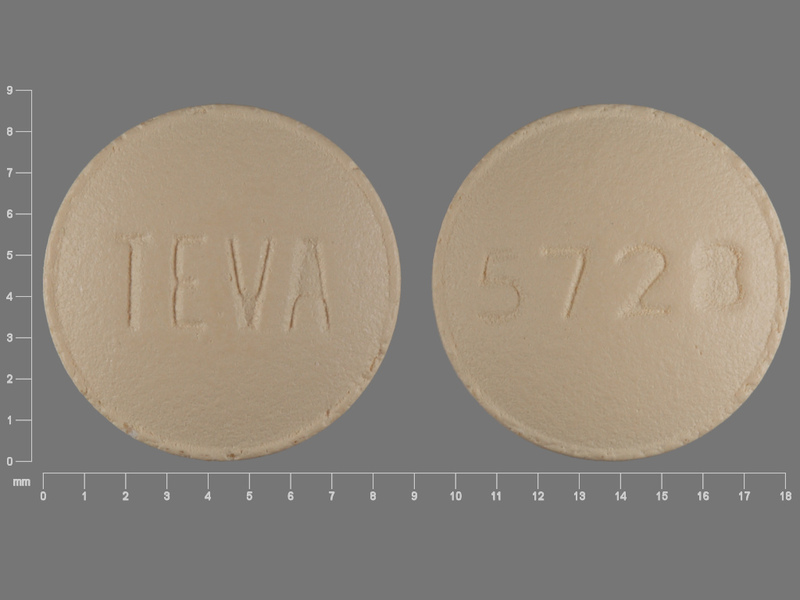 Famotidine Tablets USP, 40 mg are available as tan, round, unscored, film-coated tablets, debossed with â€œ5729â€ on one side and â€œTEVAâ€ on the other side, containing 40 mg famotidine, packaged in bottles of 6 (NDC 43063-086-06) tablets. Dispense in a well-closed, light-resistant container as defined in the USP, with a child-resistant closure (as required). Avoid storage of famotidine tablets at temperatures above 40°C (104°F).